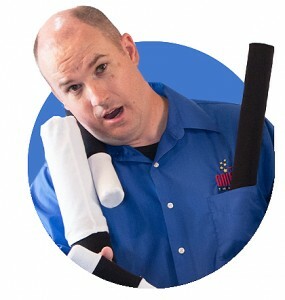 Tim performs a full stage magic show specifically designed for family audiences. 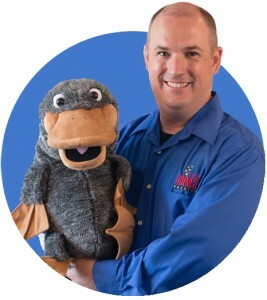 This Comedy show is great for kids and adults alike. The whole family from 4 to 104 will have a great time at this show. The show is great for any event involving the whole family, fairs, festivals, school family nights, neighborhood parties, churches, etc. This show involves the entire audience and has many opportunities for bringing helpers up on stage to participate with the magic. The family magic show also includes some of Tim’s puppet friends. Tim also performs a full stage show specifically design for the grown up audiences. Although this show is for grown ups it is still a fun clean comedy filled magic show mixed with magic and mentalism. This show is great for corporate parties, adult banquets, and conferences. Although the grown up shows are designed for older audiences there are no inappropriate for younger ages routines it is may be more than the younger audience member can understand. Tim also performs a full range of close up magic performed in an intimate setting for a group of two to 15 people. It is great for that small party of friends for that special occasion. It is also great for the come and go parties where there is no set time for everyone to be seated together. This magic is done right in the spectators hands using cards, coins, rope, rubber bands, etc. This magic is great for all ages. What child doesn’t want a magician for their birthday party. Tim has a great show just for birthday parties where the birthday child is the star of the show. The kids will be laughing and going crazy enjoying a magic show just for their friends or family’s birthday party. This show is designed to be performed in a small environment such as a living room or family room.